While some of you my be busy stuffing your face with Easter candy at home, for those looking to dig into an Easter brunch, we tracked down some of the best in town. From bottomless cocktails and expansive buffets, to an egg hunt for all ages and a petting zoo, here are our some of our favorite Easter brunch options for you to enjoy. 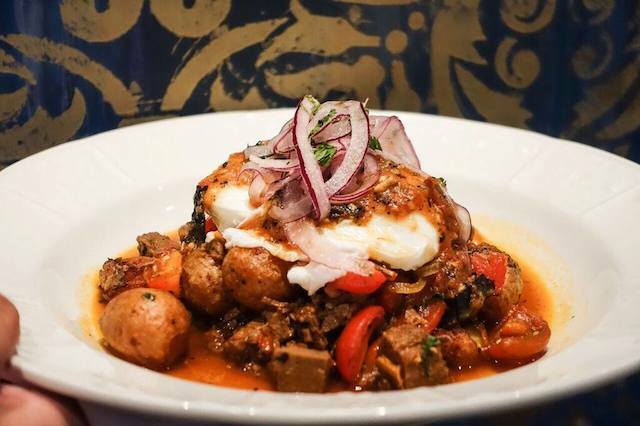 Head to El Segundo&apos;s new delicious destination for a "Nuevo Rancho" take on Easter brunch. Grab a seat on the breezy patio or in the dining room to sip bottomless micheladas and mimosas ($16) from 11 a.m. to 3 p.m. Hit up their brunch menu for smokey bites from the wood-fired grill like their beef barbacoa hash with poached eggs, roasted poblano chili omelet, and huevos rancheros. We also strongly recommend ordering from the all-day menu to try their killer potato rajas tacos and pork chili verde with sweet corn elote. Sausal is located at 219 Main Street, El Segundo, (310) 322-2721 for reservations. Uber over to Westwood to indulge in Tanzy&apos;s epic-sounding Ultimate Bloody Mary Bar for the holiday. Choose from their classic from-scratch recipe, pescatarian style (clam juice) or carnivore style (beef stock), and then go to town with garnishes that range from the usual pickles, fresh herbs and hot sauce, to towering toppings like crisp smoked bacon, cured meats, shrimp and cheese. You can also choose from Amsterdam Vodka, Evan Williams Bourbon or Camarena 100% de Agave Tequila for $12 or up your game with Grey Goose or Corzo Reposado Tequila for $14. You can also chow down on brunch specials like "bacon & eggs" ravioli, brioche french toast, crispy chicken and sourdough waffles, and corned beef hash. And there will also be a visit from the "hipster Easter bunny." While we&apos;re not entirely sure what that means, we&apos;re sure that it will be fun after hitting up the Bloody Mary bar. And then you can head next door and catch a lazy Sunday movie at iPic while reclining in cozy chairs and sipping their newly launched series of wines. Brunch is available from 10:30 a.m. to 2:30 p.m.
Tanzy is located at 10840 Wilshire Blvd. in Westwood, (310) 307-7004 for reservations. Head to the Sofitel hotel where Estérel will be offering an extensive Easter buffet and bottomless mimosas and Bloody Marys. The buffet features a well-stocked raw bar, a smoked salmon and charcuterie spread, tons of farm fresh salads, along with flatbreads, quiches and other tasty sides. Just be sure to save room on your plate—or go back for seconds—for the carving station with porchetta, chicken or branzino, the crepe station, or the excellent sounding risotto station. There will also be a dessert station and an edible garden. A la carte additions will be available table-side. Grab a seat on the beautiful, flower-adorned patio or head to the dining room to feast. The brunch buffet is available from 11:30 a.m. to to 4:00 p.m. on Sunday and is $95 for adults, including bottomless mimosas and Bloody Marys, $30 for children 12 and under, and free for kids 5 and under. Esterel at the Sofitel is located at 8555 Beverly Blvd., Beverly Grove, (310) 358-3979 for reservations. Cast Restaurant at Viceroy in Santa Monica offers an extensive brunch buffet with cocktails at a solid price. Hit up the carving station with herb roasted leg of lamb and maple glazed pork loin, order up a custom omelet, or go for the pancake and french toast station (or go for all of them). 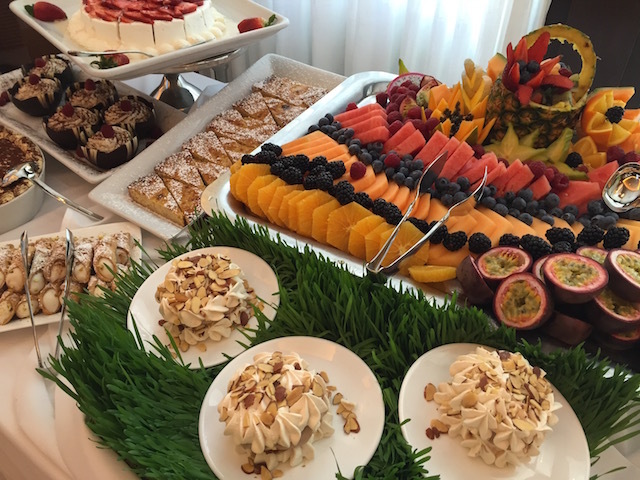 There will also be lots of salads, classic brunch dishes, shareable platters and desserts. The buffet is $65 for adults and includes either an ​​Easter Egg Martini or the London Bunny cocktail. Kids 10 and under eat for $30, and it&apos;s free for those 5 and under. 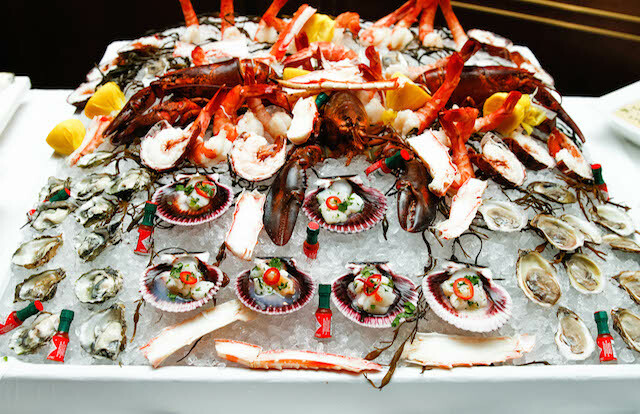 Cast Restaurant at Viceroy is located at 1819 Ocean Ave., Santa Monica, (310) 360-7511 for reservations. 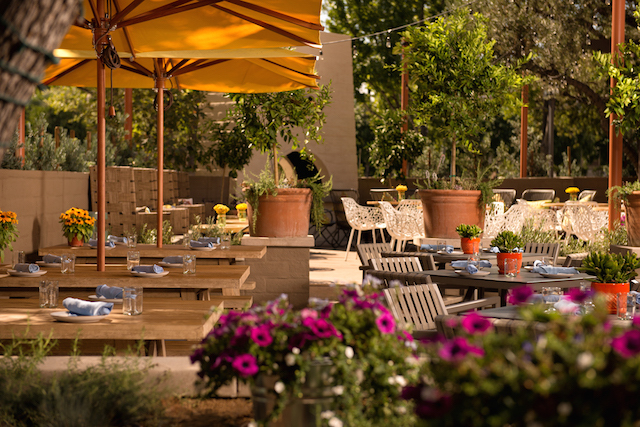 Head to The Front Yard at the recently revamped The Garland in North Hollywood for a festive, sustainably-sourced Easter buffet. Starting at $44 for adults and $19 for kids, the brunch includes highlights like pasture-raised heritage ham that&apos;s been smoked and brined with buttermilk biscuits and finished off with maple whole grain mustard glaze. Or you could go for the shrimp and grits, prime rib with pretzel rolls, or the Sunset Ranch eggs Benedict. Brunch is available from 11 a.m.- 3 p.m. 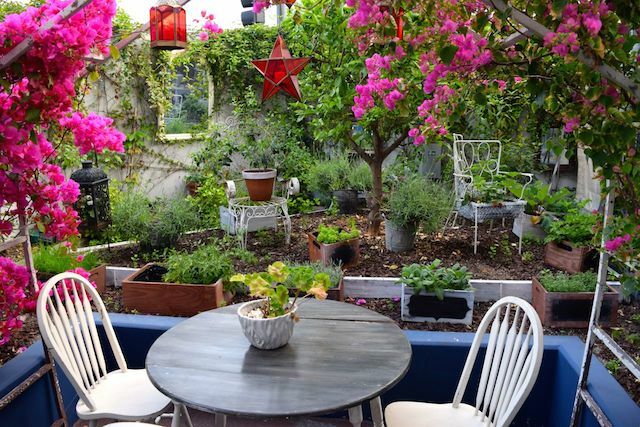 The Front Yard is located at The Garland hotel, 4222 Vineland Avenue, Studio City, (818) 255-7290 for reservations. This modern American joint in Santa Monica will help you start your Easter Sunday right with the Berry Spring Punch, which serves four to six people and includes Opera Prima sparkling wine, Lillet Blanc, ginger ale, homemade Oleo and floating strawberries. Their brunch special will be lamb hash and eggs with carrot top chimichurri, while their Easter dinner special is a roasted rack of lamb with a mustard mint crust and a pea and carrot risotto. Ox & Son is located at 1534 Montana Ave, Santa Monica, (310) 829-3990 for reservations. 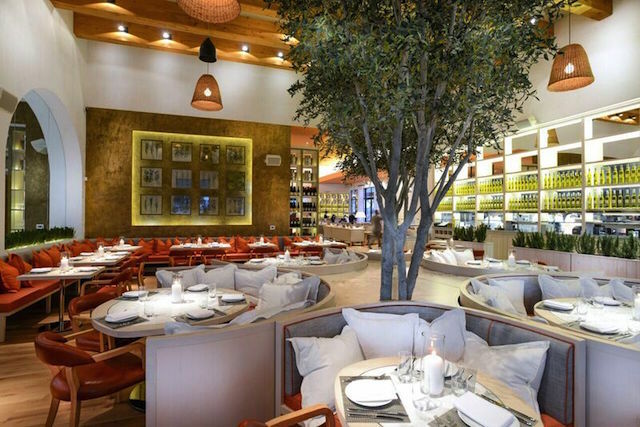 Fig & Olive Melrose Place is located at 8490 Melrose Place in West Hollywood, 310-360-9100. The InterContinental is located at 2151 Avenue of the Stars in Century City, 310-284-6536 for reservations. Clifton&apos;s Cafeteria is located at 648 S. Broadway in downtown Los Angeles, 213-627-1673. Tickets are online here. Mr. C Beverly Hills is located at 1224 Beverwil Drive in Beverly Hills, 310-226-6245 for reservations.